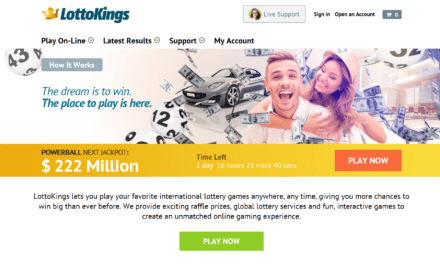 LottoKings Review 2018: An Online Lottery Site You Must Try! LottoKings might seem like a new player in the industry, but the truth is, they have been around for a while. This “new” online lottery site is actually the rebranded form of CongaLotto, one of the most well known in the field. But if you think that aesthetics is the only thing new here, think again. Much of what made CongaLotto good remains–such as the commendable ease of use or the various lottery games on offer–but they have also added new features that should enhance the overall experience. Is the addition of a few features enough to make LottoKings better than what came before it, or is it simply the same thing but with a fresh coat of paint? Keep on reading to find out! Lottery Games: LottoKings offers an impressive collection of lotteries that hail from nearly all corners of the globe, giving you more options and more opportunities to win. In total, you are looking at over 18 lotteries and 4 syndicates -- plus raffles, and 7 scratch cards. Features: Apart from the usual lottery features, such as subscriptions and multidraws, LottoKings also offers a jackpot alerts option and even 256-bit SSL security for some added peace of mind. Zero Commissions: LottoKings does not take any commissions from your winnings, ensuring that you get 100%. Of course, you will still have to pay for the relevant taxes; but that is another matter entirely, and out of LottoKings’ hands. Claiming Winnings: LottoKings offers three options for claiming prizes that are more than $600. You don't necessarily have to travel in order to claim your winnings (though some lotteries may require you to do so). Limited Payment Methods: Surprisingly, they accepted more payment methods back when they were CongaLotto. Currently, they accept around 9, which isn’t bad, but it still feels like a step back. Limited Language Support: It is commendable that LottoKings offers 8 different languages that you can switch back and forth from on their website, but other online lotteries offer quite a bit more. If you aren’t fluent in any of the languages offered, then you are out of luck. LottoKings is among those that offer lots of choices when it comes to lottery games. In total, they offer 18 lottery games that hail from all corners of the globe. The games include Oz Lotto, SuperEnalotto, Euro Millions, Megamillions, UK Lotto, Irish Lotto, Thunderball, Lotto 6/49, Hoosier Lotto, Powerball, La Primitiva, Eurojackpot, El Gordo, and more. Playing these games is a fairly easy, hassle-free affair, even if you are a newcomer. You simply choose your game and how many tickets you want to play, pick your numbers (either manually or via the Quick Pick option), and click on the Play Now button. You also have the option to renew your game, which will automatically renew your subscription after your last ticket is played. In addition, you get a discount just by renewing. You can even choose to save your numbers for a particular lotto, allowing you to quickly input your favorite numbers the next time you want to play. LottoKings also offers a Jackpot Alerts option, a customizable alert system that sends you a notification when your chosen lotteries meet your payout goals. Beyond that, you can also play syndicates, which allow you to pool your tickets with other players for increased chances of winning. Note that the games that allow you to play syndicates are only a few, but they are some of the most lucrative ones on the list. You can choose between Powerball, SuperEnalotto, Mega Millions, and Euromillions. If that is not your cup of tea, or if you simply are looking for even more chances of winning, LottoKings also offers different millionaire raffles. Some of these raffles are seasonal, like the Christmas El Gordo, or October’s Special Draw, while both the Loteria Nacional Thursday’s Draw, and Loteria Nacional Saturday’s Draw are regular fixtures. If lotteries, syndicates or raffles still don’t cut it, LottoKings also offers virtual scratch cards. You can pick from 7 different card themes, with each costing less than $2.00 for one game. In order to win, you need to match 3 images of the same type. It’s simple, but just like most scratch cards, not that easy as far as winning the big prizes go. LottoKings’ preferred payment methods are Visa, MasterCard, and American Express. But if you don’t have a credit card, they also allow you to use JCB, Skrill, Ukash, Entropay, checks, and bank transfers. Interestingly, they don’t have a PayPal option, unlike some of the other lottery sites out there; but this exclusion could be related to their anti-money laundering and security policies. It’s not a total loss, but it would have been more convenient for some people that use PayPal on a regular basis. Furthermore, they actually had more accepted payment methods back when they were CongaLotto, so it is a bit confusing to find out that they took a few steps back in this aspect. As for winnings, LottoKings continuously monitors all tickets and syndicate shares each customer purchases, allowing them to immediately contact a winner directly. Should you win a prize below $600, they will contact you via email. If your winnings go beyond $600, they will call you personally to inform you. Unlike other online lotteries where your only option is to travel and claim bigger winnings in person, LottoKings gives winners three options. For starters, you have the option of sending in a claim form, which they will hand over to the appropriate lottery commission along with your winning ticket. Once your identity and claim have been verified, the lottery commission will then issue a check in your name. That said, some lotteries might require you to claim your winnings yourself, especially if you win major prizes; like the jackpot, for instance. And yes, if you win the jackpot of a lottery game located in another country, you would have to go there on your own. Alternatively, you can also opt to claim your winnings at any one of LottoKings’ offices. Or, finally, if you wish to claim winnings yourself, they can also mail you your winning ticket through certified mail, or any other delivery method you prefer. It is also important to note that LottoKings does not take any commission from your winnings. You may have to pay the tax according to the law of your country, but that is another matter entirely. Once you purchase a ticket on their website, their agents will purchase the ticket on your behalf, and will keep it in a safe deposit box for security. Their website, meanwhile, has a standard 256-bit GoDaddy SSL, and is hacker protected. Additionally, LottoKings is licensed and regulated, which means that they are deemed a legitimate online lottery website and not some shady, fly-by-night outfit. LottoKings’ support options are fairly standard. They offer a pretty good FAQ section that covers all of the basic questions one might have about the service. Plus, the website itself does a decent job of explaining the different lottery games to newcomers. If you run into any issues, you can contact them via live chat or email. You won’t find any phone support here though, which is a bit disappointing. Other than that, you get a solid customer support offering from LottoKings. At its core, LottoKings is very much still CongaLotto–with a few improvements. They are still among those that offer a lot of choices when it comes to lottery games, for starters. You can also play syndicates or take part in millionaire raffles or virtual scratch cards. It is still very easy to use, and newcomers who haven’t tried joining lotteries online can easily jump in and start playing. In addition, the new Jackpot Alerts feature notifies you when a certain lottery meets your payout goals. Plus, you now have three options to choose from when claiming winnings over $600. On the other hand, there has been a decrease of accepted payment methods; and there’s still limited language support, which is a holdover from the days of CongaLotto. That said, these negatives do not impact the overall lottery experience, which is what is important. LottoKings is a pretty solid online lottery website. Check them out now to see for yourself! What's the Verdict on LottoKings? LottoKings is a let down. For a first time lottery ticket buyer who wanted to do this on a lark with her boyfriend, I was in for a rude shock to think that it would be smooth with these guys. I bought a ticket to the Powerball and later that day, an agent calls to try convincing me to buy that Saturday’s raffle tickets. I thought I would buy one but the transaction did not go through (the bank rejected it and wanted me to confirm). I took it as a “sign” 😛 and said maybe another time, when he asked me for another card. I said to cancel the transaction and that I wasn’t interested. The next day, I see a missed call from the same number and two minutes later an email saying that THREE raffle tickets were bought using my card!! Without any authorization at all. I was shocked and called back on the number… There was a week to go before Saturday’s raffle and I spent every day calling twice or even thrice during the day trying to get them to cancel the transaction. Numerous emails and assured confirmation from other agents resulted in my tickets getting canceled for that Saturday but the CHARGE on my card was not canceled conveniently. Please don’t buy tickets on this website. They just try to catch you off guard and fool first timers like me.